Please click here, if this newsletter does not display properly. 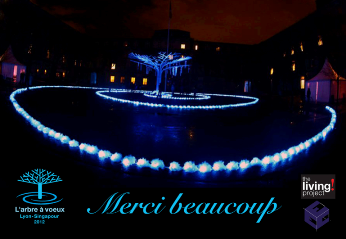 For the second year running, a Singapore art installation, titled "Wishing Tree" has been showcased at the Fete des Lumieres (Festival of Lights), December 6-9, 2012 at CHRD (note), Lyon, France. I am part of the 20-member team from Singapore, and was responsible to craft the 6 meter tall tree. I am attaching some images for your viewing interest. note:CHRD-Center of History for Resistance and Repatriation . Click on this link to view article on Business Times. Note: Ms. Dixie Wu, Mr. Khor Tuck Kuan, and Mr Kenny Eng are to be thanked for some of the photos and videos shown in this newsletter.